Quiet Lunch Magazine ‡ Sept. 3rd, 2012. – September 9th, 2012. | | Quiet Lunch. Quiet Lunch Magazine ‡ Sept. 3rd, 2012. – September 9th, 2012. 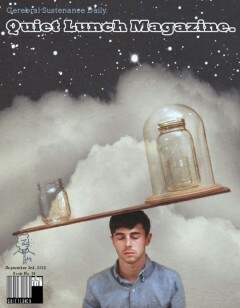 This issue features the work of conceptual photographer Nick Scarpinato. We take a look inside Scarpinato’s work and examine the surrealist nuances of his many masterpieces.